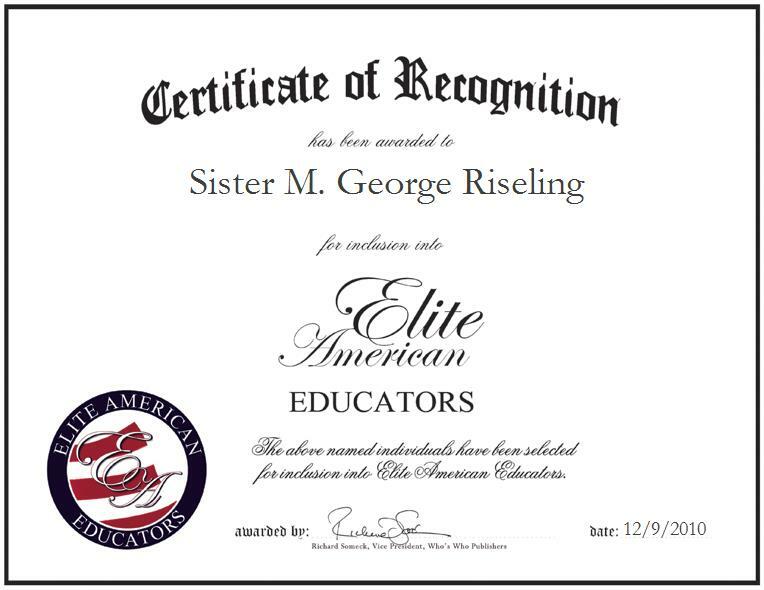 Naples, Florida, December 9, 2010, Sister M. George Riseling, Academic Dean, Saint Ann School, has been recognized by Elite American Educators for dedication, achievements, and leadership in educational support services. An impassioned educator, Sister Riseling has spent six decades infusing her stick-to-it attitude into every facet of her professional career. For the last decade, she has served as the academic dean of Saint Ann School, a Christ-centered and intellectually challenging academic institution for students in preschool through eighth grade. Sister Riseling is of the belief that there is no professional feat more rewarding than helping students to succeed, thus she feels blessed to be involved with witnessing children blossom into educated and knowledgeable members of society. On a daily basis, Sister Riseling is responsible for overseeing the school to ensure safety and quality education. By supervising the teachers at Saint Ann school, she is best able to assess, evaluate and formulate plans to continue the school’s reputation of providing progressive academics. She coordinates with her staff to uphold the standards of the school while maintaining a positive employee atmosphere. Throughout her tenure as an educator, Sister Riseling has refined an expertise in teaching assistance, which she bestows upon her staff to encourage a collaborative dynamic between educators. Sister Riseling holds a master’s degree from the College of Saint Rose in Albany, New York. In 1995, she was named Principal of the Year and received recognition of honor in Toronto, Canada. Most recently, she earned the title of Professional of the Year representing Educational Support Services by Cambridge Who’s Who. Sister Riseling also realizes her successes in the achievements of her students; the most gratifying aspect of her career is watching students accomplish the personal and professional goals they set for themselves in the short-run and the long-run. When she is away from her professional duties, Sister Riseling enjoys reading, bird watching and showcasing her support for the Washington Redskins. An individual always striving for more, she intends to continue in her capacity as academic dean and catapult herself professionally to nurture students and teachers.